Here is my effort to reproduce the Vermeer and Rahmstorf’s model linking sea level rise rate to temperature. I am reproducing their results here is so I will have more credibility in subsequent posts when I criticize some of their claims about the significance of those results. The 2009 PNAS paper by Vermeer and Rahmstorf will be referred to as VR2009 for the rest of this post. The VR2009 idea is to take the measured sea level (H) and extract its time derivative (dH/dt, the sea level rise rate) and the measured temperature and extract its time derivative (dT/dt, the rate of temperature change) and insert them into equation 2. Then the values of a, b and T0 can be found by adjusting their values to minimize the difference between both sides of the equation. VR2009 claims that the model in equation 2 is superior to the equation 1 model. They explicitly state that their ﻿﻿”analysis shows that the dual model [equation 2] is the preferred model, suggesting also here that the second term is physically meaningful.” In subsequent posts I will show that this claim cannot be backed up. I have chosen the much simpler smoothing technique of applying a gaussian filter, with some minor variations. Figure 1 shows the Church and White sea level data overlaid with its derivative, the sea level rise rate, dH/dt. The point of the following plot is the extremely noisy nature of the sea level rise rate data. 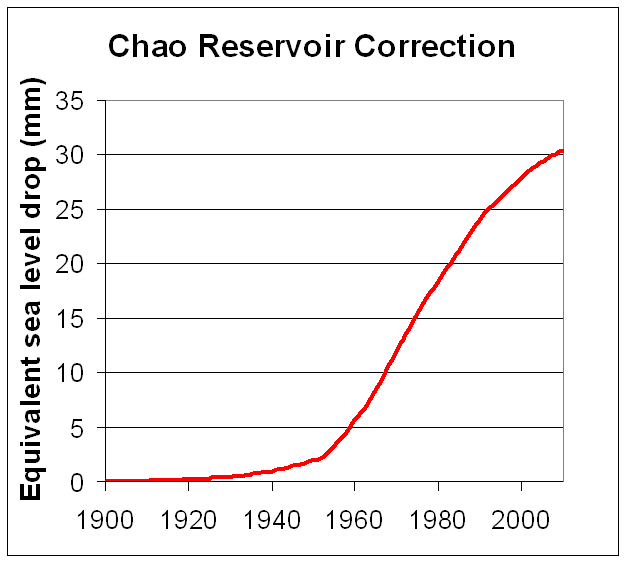 Vermeer and Rahmstorf added Chao’s reservoir correction from the sea level. This correction is supposed to represent the fraction of water that has been impounded on land in artificial reservoirs which would otherwise be adding to the sea level. I don’t think this correction necessarily makes the sea level data any more accurate because it neglects the counteracting effect of aquifer depletion. However, I include it in order to reproduce Vermeer’s and Rahmstorf’s results. The Chao data, figure 2, was acquired by digitizing the plot from Chao’s paper. 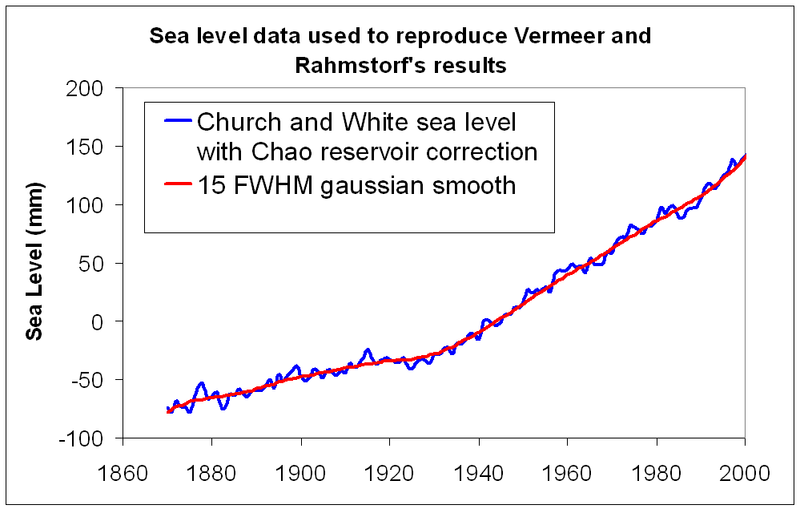 Figure 3 shows the annual Church and White sea level data with the Chao reservoir correction added (blue) as well as a 15 year gaussian smoothed version (red) that is used in my implementation of the Vermeer and Rahmstorf model. Figure 3. Church and White monthly sea level with Chao reservoir correction (blue), and 15 year FWHM Gaussian smoothed version (red). Figure 4 is an animation of the sea level smoothing process and the resulting sea level rise rate. I have included it to make clear the profound effect that smoothing has on the sea level rise rate. The top plot shows the Church and White sea level data and its smoothed version as smoothing increases from a 1 year FWHM gaussian filter to a 15 year FWHM gaussian filter. The middle plot shows the time derivative (sea level rise rate, dH/dt) along with its smoothed version. the bottom plot shows the same smoothed sea level rise rate data as the middle plot, but expanded for easier examination. Notice that the sea level rise rate in the middle plot (thin white plot) looks nearly random. Distinct features appear as smoothing (red plot) starts out but get ironed away as smoothing increases. 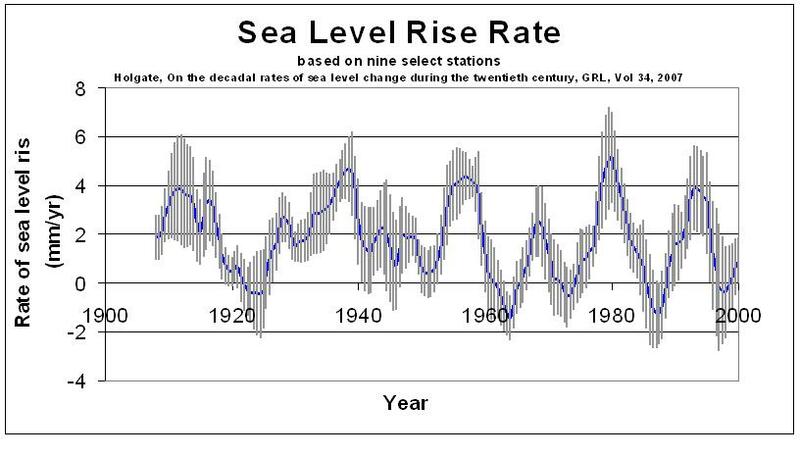 (As an aside, here is Simon Holgate’s version of sea level rise rate from his 2007 Geophysical Research Letters paper. Holgate sea level data was included in 2004 IPCC assessment. Notice that in Holgate’s judgement short period features, on the order of ten years, are significant.) At what smoothing level are real sea level rise rate features being removed? I don’t know. I question whether it makes sense to apply this extreme level of smoothing, but did so to mimic Vermeer’s and Rahmstorf’s 15 year smoothing period. Like Vermeer and Rahmstorf, I used the ﻿GISS Global Annual Mean Surface Air Temperature Change. I smoothed the data with a 20 year gaussian smooth for 1880 to 1894, and a 15 guassian smooth from 1895 to 2000. Figure 5. 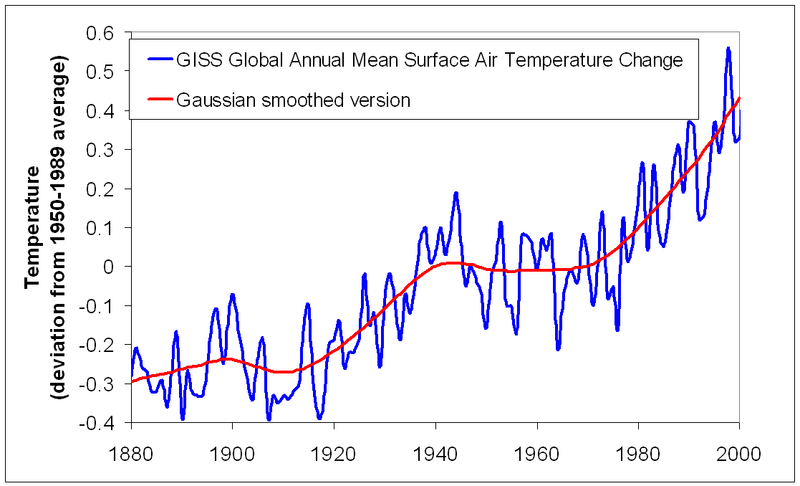 GISS global temperature and 15 year gaussian smooth. So, my results were a very close match and well within Vermeer’s and Rahmstorf’s quoted uncertainties. Figure 6 (click to enlarge) is a side by side comparison of Vermeer’s and Rahmstorf’s sea level data (left) and my sea level data (right). Vermeer’s and Rahmstorf’s data is a copy of their plot from the bottom of their figure 3. They say the red line is “Observations based rate of sea-level rise (with tectonic and reservoir effects removed). The gray line is their result for equation 1, above, for their best values of a and ﻿To applied to their smoothed temperature data. The blue line is their result for equation 2, above, for their best values of a, b,and To applied to their smoothed temperature data. My results use the same color scheme. The red line is the Church and White sea level data (which already has tectonic effects removed) with the reservoir correction from Chao added. The gray line is my result for equation 1 and the blue line is my result for equation 2. Figure 6. Sea level data with reservoir correction (red) and the model results. Vermeer and Rahmstorf (left). ClimateSanity (right). Figure 7 (click to enlarge) is a side by side comparison of Vermeer’s and Rahmstorf’s sea level rise rate data (left) and my sea level rise rate data (right). 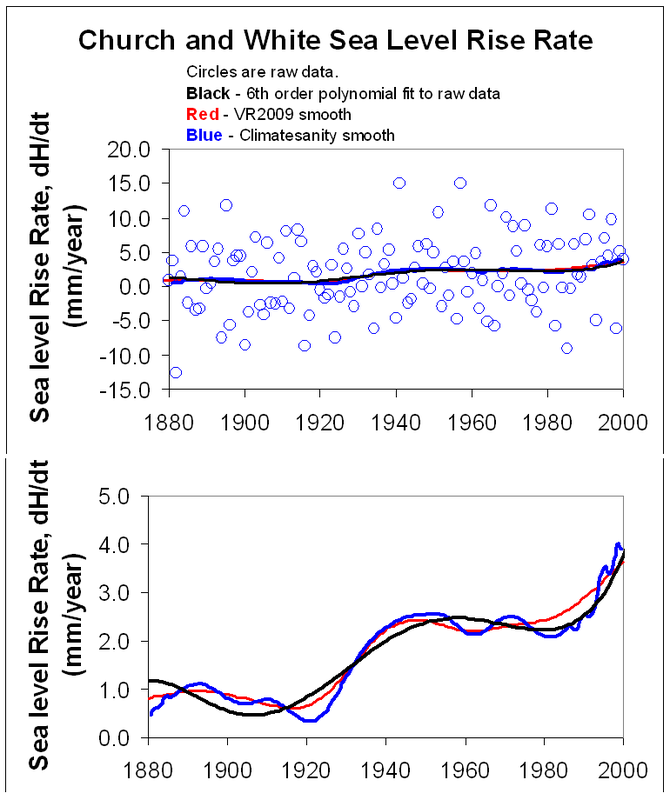 Here the red curve is the input sea level rise rate with smoothing applied . The gray and blue curves are sea level rise rates that result from equations 1 and 2, respectively. VR2009 data is on the left, ClimateSanity data is on the right. Figure 7. Sea level rise rate data with reservoir correction (red) and the model results. Vermeer and Rahmstorf (left). ClimateSanity (right). The red curve on the right side of figure 7 is the same same as the red curve that forms in the middle and bottom plots of the animation in figure 4. It is my version of the smoothed Church and White sea level rise rate with the Chao reservoir correction, dH/dt. Why is it so different from VR2009’s version of the same data (the red curve on the left side of figure 7)? Simply put, it is because of the degree of smoothing and the smoothing technique. As I pointed out above, I have my doubts about the appropriateness of applying this heavy smoothing. Perhaps it might have been just as good to fit the sea level rise data to a polynomial. Figure 8, below, shows the sea level rise rate raw data, a 6th order polynomial fit, VR2009’s smoothed version, and my smoothed version. Figure 8. Church and White sea level rise rate with Chao correction and various smoothing functions. Here is a minor curiosity that leads me to doubt sea level smoothing of VR2009. 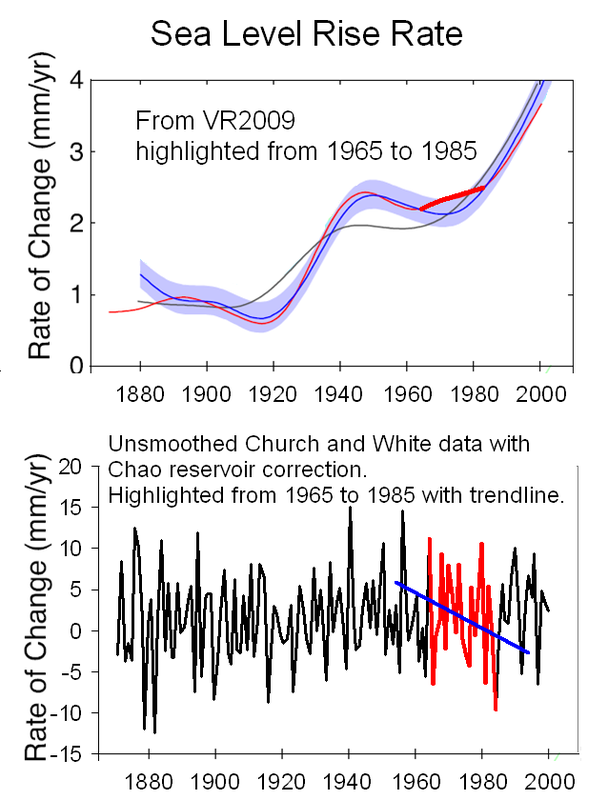 Look closely at their smoothed sea level rise rate from 1965 to 1985 and the unsmoothed Church and White data with the Chao reservoir correction, highlighted in figure 9. This is a 20 year period where the VR2009 smoothing algorithm falls flat on its face. I am not claiming that my smoothing technique is any better. I am just pointing out the difficulty and uncertainty in smoothing data that is this noisy. My goal with this post was to demonstrate the I can closely reproduce VR2009’s results in terms of a, b and T0 in equation 2. I have succeeded in that. I have shown VR2009 is correct when they say “The precise choice of smoothing method is not critical to our results.” My ability to reproduce their results will lend some credibility to my criticisms that I will express in a subsequent post after laying more foundational work. I will show that their ﻿﻿analysis which which they claim shows “that the dual model [equation 2] is the preferred model” is just plain wrong. Rahmstorf’s first model (equation 1) was bogus and the “preferred” Vermeer and Rahmstorf model (equation 2) is no better. Thank you for this interesting sequence of articles. A few months ago I had posted a comment about how a simple 2 line segment fit the GMSL record much better than Church’s parabolic fit. Although I haven’t done the spreadsheet to confirm it, it is pretty evident by eyeball that Chao’s correction makes the 2 line segment fit with a breakpoint around 1930 an even better fit. I don’t have any fancy math or theories as to why this should be true. It’s just a simple observation that the best fit for the data is a relatively simple model of two straight line segments. 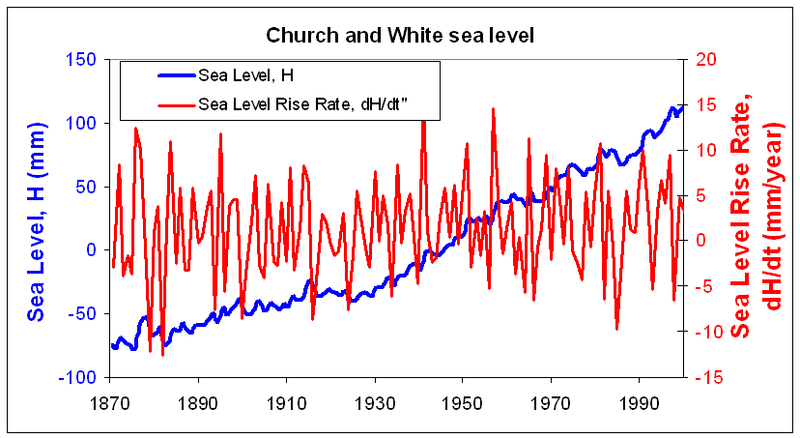 It is also important to note that Church and White updated their sea level data in 2009. The updated version was not used by VR2009. The difference is dramatic. Thank you for your clear analysis. When can we expect the subsequent post?